Tennis is a competition sport requiring good hand-eye coordination, endurance, skill, strength, and agility. Players need to be committed to being physically fit and willing to work on personal conditioning year round. Tennis definitely should not be played to “get into shape." Trying to play in poor physical shape will likely lead to an unwanted injury. Tennis actually has a history of several centuries, going back to European monks in the 14th Century. That game originally was similar to what we now call “hand ball.” The monks soon added the first version of a racket, which was probably made of wood and leather. The first ball was wooden, and soon evolved into a leather surface, filled with a fatty substance. The French royal families adopted the game, and during the 16th to 18th centuries, it became known as “real tennis.” The version of tennis played today originated with the English game of lawn tennis first played in the United Kingdom in the late 1880's. The court surface will affect the speed and bounce of the ball, with each being different. 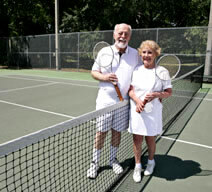 Clay courts are usually the courts of choice, especially for older people. Clay puts less stress on the knees and back during play. They do not radiate as much heat and are therefore cooler to play on than asphalt or concrete. The ball motion is a little slower, permitting longer rallies. The down side is that clay courts require a lot of maintenance on a daily basis. Newer clay courts are built with subsurface irrigation, which does help to reduce the amount of work needed each day to take care of the court; but the subsurface irrigation system does not eliminate the need for continual maintenance. Interestingly, clay courts are not really made of clay. The “clay” material is a combination of a man-made plastic material, rubber, and crushed stone. Hard surface courts are often made of concrete or asphalt. Because concrete is a much more maintenance free surface material, concrete courts are a reasonable choice for school playgrounds and community parks which are open for general use or intended for multiple sports, such as basketball, volleyball, shuffleboard, and hopscotch. A solid asphalt court will crack easier and otherwise develop uneven playing surfaces over time. Some concrete courts will have a top surface made of a mixture of materials that provide a little more cushioning effect, such as a mixture of a rubberized material with asphalt. Hard surface courts are quite hard on adult backs and knees. The motion of the ball is a little faster and the bounce of the ball is quite predictable, making play a little more fast paced. Grass courts, as are used in Wimbledon, require the most maintenance because the grass must be cut almost daily and the court markings repainted with each mowing. The soil surfaces will not remain completely smooth with weather and use, so the surface must be rolled with a heavy roller regularly. Because of the irregular surface, the ball will not always have a predictable bounce, reducing the players' reaction time, and the game is more fast-paced. Indoor courts will have a variety of surfaces, from concrete to man-made materials to carpet. The advantage of indoor courts is that you can play year-round in an environment that isn't too cold or too hot. The disadvantage is that the pace of the game will be quite fast, and the surfaces often will put greater stresses on your backs and knees. Select your tennis shoes according to the surface of the court you will be playing on. Use shoes with smoother tread on clay courts, as shoes with rougher gripping soles can damage clay surfaces. Shoes that give good cushioning support upon landing from a jump are best for the hard asphalt or concrete courts. You will do better on grass courts with shoes that have very shallow spikes or bumps on the tread to provide a little more traction. Your tennis shoes need to provide good ankle support. The toe box needs to have plenty of room for your toes to move, and your toes should not be touching the end. By keeping your toenails trimmed, you will also help protect yourself from a "tennis toe” injury, caused by jamming your toe into the inside of the toe box of the shoe on hard, quick stops. Try your shoes on wearing the socks you will be wearing when playing tennis. Select socks with additional cushioning or use two pair of socks. You will want your socks to be the kind that will wick away moisture, not just absorb it. It is also reasonable to add cushioning heel inserts into your shoes, if you find you need them. Because tennis is a high level active aerobic sport, select clothing that will help keep you cool, will wick away sweat, and will still allow for freedom of movement. As a result, jeans and t-shirts are not appropriate. Instead, select light colored or white tennis or athletic clothing made of a cotton-poly blend type of fabric. Women probably will be more comfortable with a sports bra as well. Head and wristbands are also very helpful to absorb sweat. Today¹s rackets are better engineered to be lighter and stiffer, which will help reduce forces to the arm and elbow during play. It is important to have a grip that is the right size for your hand. If the grip is wrong, greater force is transferred to the tendons of the elbow, leading to overuse injury problems, such as Tennis Elbow. Both the size of head and the stringing of the racket affect play and overuse injuries. A bigger head will have a larger “sweet spot” that will help protect the elbow. Natural gut strings are preferred to synthetic polyester strings because the gut strings also help reduce the forces put on the elbow during contact with the ball. One good way to get hurt is to try to play a tennis competition out of shape. Your brain will be thinking you need to do things on the court your body is not prepared to do. Overuse injuries, as well as some traumatic injuries, are more likely to occur for just this reason. It is important to maintain good overall muscle tone. For tennis, pay special attention to the condition of the muscles in your shoulders, abdomen, back, thighs, calves and ankles. Good muscle tone will act as a shock absorber, helping to provide a degree of protection from repetitive use injuries. Another way to get hurt is to play with and against others who play a more competitive and aggressive game than you do. Play with others with similar skills and personal fitness. Consider taking a few refresher private lessons before the start of each season as a pre-season warm-up and to review technique. Have your Pro watch to be sure you are not arching your back during serves and overhead shots. Check to be sure your backhand swing has not become sloppy. Also have your Tennis Pro check you equipment to be sure you are using the proper racket and grip for your strength, size, and age. Core body conditioning is very important in protecting your back from the impact of landing from a jump or making a lot of sudden, quick starts, stops, and turns, which are all typical and necessary in tennis. Good agility and flexibility are vital in tennis, and should be part of your regular workout routine. Some injuries, such as a hamstring pull, ruptured Achilles tendon, or plantar fasciitis, are due to not being flexible enough. It takes time and regular daily stretching to increase flexibility. The stretching done just before competition is not the same. The two forms of stretching serve different purposes. Stress fractures of the shin are due to putting more stress on the leg than the muscles of the leg are really prepared to handle. This is a typical problem from either not being in good shape when competing or from trying to rush overall conditioning in too short a period of time. The lack of conditioning can be made worse if you are using a shoe with poor cushioning, or if your shoe tread is no longer in really good shape. Tennis Elbow (lateral epicondylitis), as well as Golfers Elbow (medial epicondylitis), is a vague elbow pain without any history of trauma or injury. While holding your hand out and upright, if the pain in the side of the little finger, you have Golfer’s Elbow, and if the pain is on the thumb side, you have Tennis Elbow. This condition occurs due to overuse of the big muscles of the upper part of the forearm. It can be from playing with incorrect form, especially the backhand, or when not in proper physical condition. Even though it hurts, the elbow should appear normal. There is seldom any swelling. To help take the stress off of these tendons to allow them to heal, you can purchase a tennis elbow strap at your pharmacy. This will help shift the forces to a lower part of your arm, permitting you to continue most activities reasonably well. You also might consider shifting to a two-handed backhand swing. Talk to your Pro about your racket. It might not be the best one for you, and this could be adding to the problem. Tennis elbow usually will improve over time given basic conservative care, but it can take several weeks to a number of months. If your elbow is red and inflamed, numb or tingling, looks deformed or broken, or if you cannot bend your elbow, you should see your physician. The chances are you have a more serious problem. Your physician needs to be sure you do not have a problem with a disc in your neck, an infection, or a fracture of the elbow which will require professional medical treatment. If you have a history of ankle sprains, try walking forwards and backwards for a few minutes every day on a 2x4 or 2x6 plank as part of your regular conditioning routine. This will help maintain ankle strength and, even more importantly, increase good proprioception, assisting your foot in knowing where it is when landing from jumps. Ladies might enjoy adding aerobic or pilates dance to their fitness training just to provide some variety in workouts. Dance works muscles not often as used in normal life, but which become important on the tennis court. Dance also can include rapid movements in a variety of directions, similar to tennis. If you are having trouble with blisters on your hands, try drying your hands and your racket handle as frequently as you can. Most importantly, do not ignore pain. 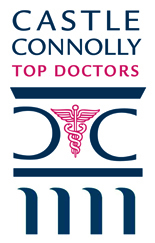 Have your doctor check it out to determine the cause and what to do about it. If you wait too long, you might end up with a more serious injury. Because of the amount of water lost through sweat in practice and competition, hydration becomes extremely important. Drink plenty of water before, during, and after each practice or game. Young children are not yet able to handle the running and agility required on a tennis court. When a child expresses an interest in learning tennis, you can have family playtime pitching tennis balls where he or she can start learning how to hit them using a lightweight racket with a handle that fits a small hand. At this point, keep it something you do for fun. Once your child is physically old enough to have the endurance and strength needed on the court, ask a Tennis Pro to help you select a tennis racket appropriate for your child and sign him or her up for children's classes with others the same age. For more information about tennis and how playing tennis safely can help maintain your health, the United States Professional Tennis Association has established a new web site, TENNIS - for the Health of It, which you might also find helpful. For after-hours orthopedic emergencies, Dr. Parr prefers you call him directly at 281-491-7111 or 713-954-1343. He may be able to help you get treatment faster and save you an expensive ER bill.